A quiet place to sit and reflect, families who have lost a child may place their name in designated locations. Positioned behind the roof waterfall to remember the 202 innocent victims of the 2002 Bali Bombings. Marble and metallic finishes,water features and wall of hands that represent the many people that have helped in this project. Provides a social activity for individuals, teams, families and tourists, catering for any age and ability. The Bowling Alley will be run as a commercial business generating the main income to sustain the entire complex’s operations. 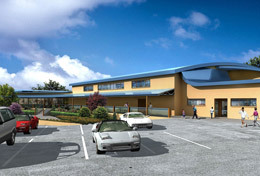 The Bowling Alley will provide employment and training for young people. Will serve light refreshments and provide employment and training for young people. Seating 120 people; it will provide a venue for functions, educational programs, conferences and meetings, group activities, training sessions, workshops and support group meetings. It has a kitchenette and is connected to the commercial kitchen. This room will have teleconferencing video link up facilities. The Administration area will be used for the complex’s management operations. Designed to provide a free space where young people can meet, feel comfortable and socialise with other community members. On school mornings the lounge area will provide free nutritious breakfast. It will have a computer lab, internet access, music and flat screens, and host short courses and screening nights, poetry and talent nights. It will become a casual meeting place for the community and tourists which is fully supervised at all times. Culinary training school and TAFE facility. We will also run cooking lessons and programs: e.g. teaching disadvantaged people to cook nutritious budget meals for the family and will also store their meals labeled in freezers if required. The kitchen will cater for large events, functions and conferences providing an additional income stream and skills training. National facility that will host country championships, train gymnasts from toddlers, and include a soft play area which can be utilized by the disabled to the elite. The sprung floor will also be used by mainstream sports, martial arts and circus programs, with foam pits for high ropes, rings and trampoline sports. A rock climbing wall is planned. 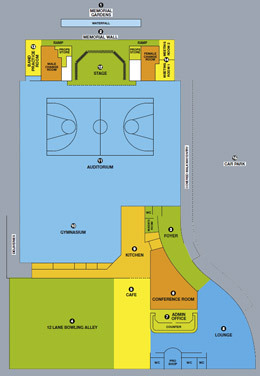 Multi-functional area to provide activities for groups and teams with the capacity to host exhibition games that can be nationally broadcast including: basketball, netball, soccer, badminton, volleyball, table tennis and boxing. The entire floor will be sprung enabling a variety of commercial activities including dancing, ballroom and Latin American championships, physical culture and circus acts. Theatre style seating will cater for 1500 + and will attract conferences, exhibitions, bands, theatre restaurant, plays and international artists. Professional sized with prop stores and interconnecting dressing rooms. This will cater for productions ranging from School Plays to Rock Bands. A soundproof practice room, recording studio and teaching facility that interconnects with the stage. For community use/ programs which can also interconnect to the stage when required. 70 controlled spaces in the basement and 140 external spaces. Bus drop off area and 3 bus parking bays will all be available on site. There will also be provision for heavy truck parking.